Viezu are pleased to announce our very special summer promotion on the Audi S4 and A4 Range of fantastic vehicles. The first vehicle of our summer special offer is the ground breaking Audi S4 Range of vehicles, this offer is for the following models. The Audi S4 4.2 V8 Quattro B6 Saloon and Avant including Cabriolet from 2003 to 2005. The price for this Non Resonated Cat-Back exhaust with 100MM Jet Trims including fitting and remap will be £1099 including vat. We then have the Audi S4 4.2 V8 Quattro B7 Saloon and Avant including Cabriolet from 2004 to 2009. The price for this Non Resonated Cat-Back Exhaust with Quad 76.2MM Trims including fitting and a remap will be £1,149 including vat. The next vehicle is the fantastic Audi S4 3.0 V6 B8 Supercharged 2009 to 2012 and this will be for Non Resonated Cat-Back with Twin GT80 Trims Race Version, and this includes free fitting and a customised remap. The Fantastic Summer offer on this exhaust is £1949 including vat. The last version of offer for the S4 is the Audi S4 3.0 V6 B8.5 Supercharged 2012 and Later. This is a Cat-Back Exhaust Race system with Polished Tips and includes free fitting and a fantastic remap to transform the wonderful S4. The price for this wonderful package is £1,999 including vat and includes fitting and the remap as stated above. At Viezu we pride ourselves on delivering outstanding promotions to benefit our exclusive customers and delivery quality and performance without compromise. For the Audi A4 the first offer is for Audi A4 2.0 TFSI S Line B8 2WD and Quattro Manual only Saloon and Avant 2008 to 2011. This is a Dual Outlet Cat-Back that requires a A4 3.2 Dual Outlet Rear Valance available from Audi. This Cat-Back including free fitting and remap will be £1599. This is also available for the Tiptronic at the same price and including the fitting and a remap. Please advise us on which version you have when ordering the exhaust. The next exhaust special offer is for the wonderful Audi A4 2.0 TDI B8 140 PS/ 177PS 2WD Saloon and Avant S Line Models Only 2009 to 2011 and Requires A4 3.2 S Line Dual Outlet Rear Valance. The Cat-Back Exhaust for this model will add a subtle sound increase, and is used to make your Audi A4 more aesthetically pleasing. When combined with our Customised remapping and free fitting this is a fantastic choice. Our Special Summer Promotion price is £1,459 including vat. Finally we have a A4 3.0 TDI B8 Quattro Saloon and Avant 2008/2011 we have a Cat-Back exhaust plus free fitting and a remap for a fantastic price of £1,499, and these will provide a more aesthetically pleasing look and when combined with the remap will transform the overall feel and driveability of these fantastic cars. Our Mission is simply to offer our customers the highest quality products at a reasonable price and provide a high level of knowledge and service to all of our clients. This outstanding special offer provides our clients with a wonderful opportunity to get the power and performance that is desired without compromising reliability and quality. 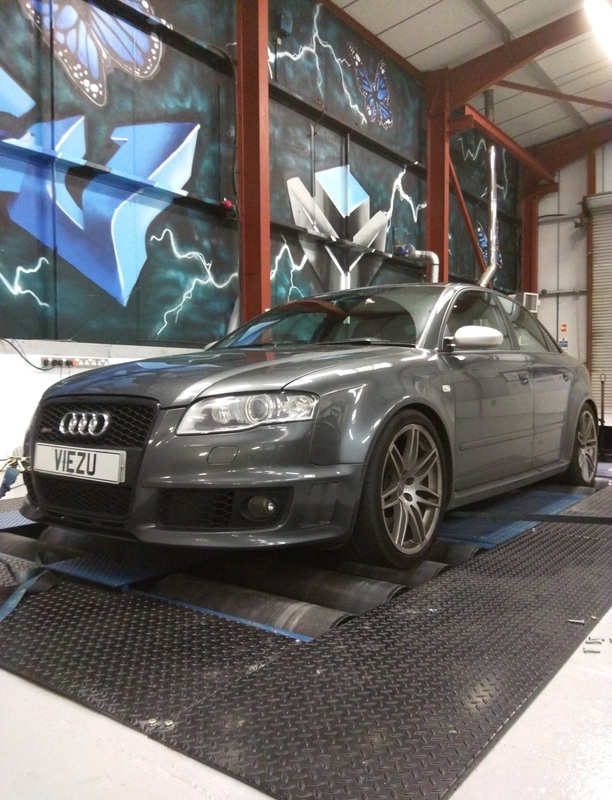 At Viezu we offer custom remapping and all our tuning programmes are developed in-house at the Viezu HQ in the UK using a rolling road and tested to USA Californian emission regulations ? the toughest in the world.